Satisfies the General Requirement for Arts and Letters; The Cross Cultural Requirement of the College's General Education Curriculum; Fulfills Sectors 2 and 6 of the English major. Globalization is the buzz word of our times. It is commonly understood as the breakdown of national and geographic barriers. Such a breakdown can have widely divergent results—from new types of food consumption to organ trade. Which parts of globalization are new, and which are based on older histories? How is globalization experienced in different parts of the world and by different people? How is represented in different media? And how are these representations themselves part of global circuits? 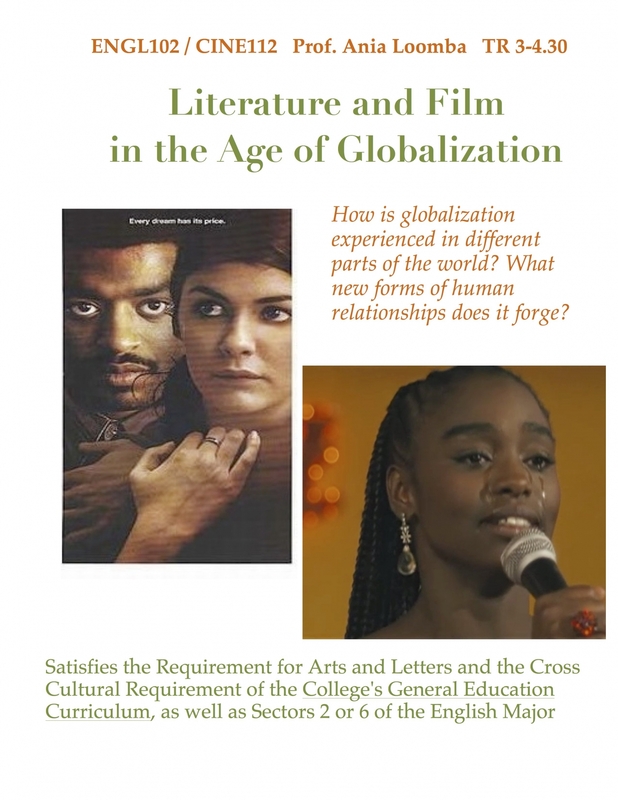 We will explore these questions through acclaimed and controversial fiction and cinema produced in Europe, the United States, Asia and Africa. We will also examine how global marketing shapes these stories. Films will likely include Spanish director Icíar Bollaín’s Even the Rain (2010); British director Stephen Frears’ Dirty Pretty Things (2002); Brazilian director Fernando Meirielle’s The Constant Gardener (2005), and Malian director Abderrahmane Sissako’s Bamako (2006); literature will include Graham Greene’s classic The Quiet American; Japanese-American writer Ruth L. Ozeki’s My Year of Meats, Italian writer Amara Lakhous’s Clash of Civilizations Over an Elevator in Piazza Vittorio and Indian writer Manjula Padnabhan’s play, Harvest. Assignments include short (250 words) weekly responses and a final exam.